Note: This website persona article is a cross-post from our sister organization, GovLoop. The original article can be viewed here. Many government agencies struggle with creating relevant content that meets the needs of their website audience, often because they are unclear who their audience is. 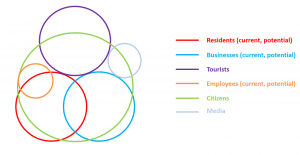 I frequently hear government clients refer to their website visitors as residents or citizens, saying, “we want our website to serve our residents” or “let’s make sure this task is easy for our citizens to complete on the website.” But are these persona categories the most appropriate when website goal-setting? There are many ways to get to the bottom of this, from simply looking at your website analytics to doing a full user experience (UX) study to identify audience personas and needs. But at the highest level, it’s important to first answer a basic question: what do we call government website visitors? Read on for a breakdown of website visitor definitions based on my experience working with government website clients. Your agency might differ, especially if your site is more focused on government-to-government or government-to-business activities, rather than individual users. I acknowledge that some tasks are local and others are federal in nature, but mostly these groupings cut across levels. First, you’ve got your residents, both current and potential (this category is more relevant to local government websites than state or federal). Current residents visit the website to accomplish day-to-day tasks such as getting a library card or figuring out the trash pickup schedule. Potential residents might want to see the types of parks and recreation programs you have for their kids. I’ve found that local governments are hyper-focused on this persona. 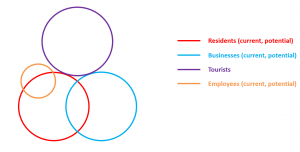 Next are your current or potential businesses, some of whom might also be residents. Current businesses might visit the website to get a construction permit or see if your budget is going to include building more parking near their location. Potential businesses might look at your website to see how business-friendly you are. For example, a franchisee deciding whether to open her new sandwich shop in your city or the next one over will first research how easy it will be to conduct business with you vs. your neighbor. All else being equal, she will likely go with the location where the website makes her feel more welcome. Some governments are more tourist-focused than others for practical reasons. It’s very likely that Hawaii.gov spends a bit more time on this type of persona than other states. Tourists by definition don’t live in your jurisdiction and are likely visiting your site to find specific information related to recreational activities (e.g., discovering things to do, getting a hunting and fishing permit). 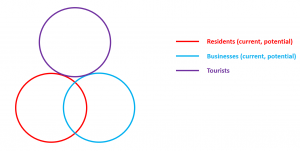 Remember that most tourists will have few reference points in common with you, so avoid using hyper-local terminology that only a resident or frequent visitor would understand. All successful organizations need to recruit and retain employees, and government is no different. Unfortunately, few agencies spend much time making their websites employee-friendly, which is especially concerning when compared to how much effort their private-sector counterparts usually put into it. After all, you’re likely competing with the private sector for qualified candidates, so you need to make sure your website clearly conveys your culture and benefits and makes it as easy as possible for people to apply. Don’t forget, your potential employees are also potential residents, married to potential business owners, parents to potential users of your parks and libraries, and related to potential tourists. Pay attention to all of these if you want to recruit the best. Many of your site visitors are citizens, and many of your website tasks are only available to citizens. 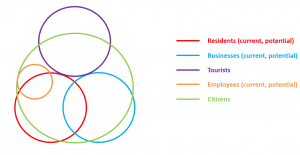 Keep in mind that not all residents, businesses or tourists visiting your site are citizens. Some could be residents working under a Green Card, overseas businesses looking to locate in the U.S. or foreign tourists looking to plan their next vacation. They have to complete tasks on your website just like a citizen might. Some, but not all, government websites will have frequent visits from the media. The media uses your site as the “source of truth” on issues (or at least your agency’s truth) rather than trying to filter through the noise of social media or wait to get hold of a spokesperson from your agency. Not all media will be citizens, especially if your agency is world-renowned, so be careful about assuming too much about what they know about you and those you serve. Ready to serve all website persona types with a government-focused, flexible CMS? Learn more about govAccess or contact us today!